Till early last year I was calling this body of work Mas(k)culinities for reasons that seemed right at the time. Masculinity is stigmatized and problematized and I sought different sexualities to explore the breadth of being male. During this period voices and images of women were included to elaborate masculinity from their perspective. Soon I realized that fissures and scars caused by these simplistic binaries run very deep within all of us. Obliged to play out the ‘normative’ roles assigned from the time of our births onwards, is a patriarchal hegemony that has to be challenged. Individual point of views that encompass realities beyond dictates of the mainstream is the only way to disrupt this control. We have to create safe spaces for celebrating the ‘human’ in all its manifestations rather than be threatened by difference. Sessions: In a face to face, one on one interaction, men, women, and individuals moving fluidly through these classifications reveal aspects of self in relation to their ideas of gender through audio recorded interviews with me. Sometimes I ask to bring significant objects that they would like to be seen with; objects that have a deep personal resonance. On other occasions pieces from my home studio are selected for which they show spontaneous affinity. Post conversation, whilst recalling their deeply personal stories, guided by my intuition I describe how I would like to photograph them. It’s a collaborative dialogue. More than often the individual is quite content with my proposal, equally well at times the idea is embellished by their input and at times, an altogether fresh approach is suggested. In the early years of photography, posing for a daguerrotype took exposure times as long as fifteen minutes. I use around 1/30 sec exposures, but to photograph the entire pose, it takes the same time as with the old processes. Requiring a degree of stillness, the pose has to be held between ten to fifteen minutes. Steered by an imagined final image, people are directed to revisit key moments of their story I feel pertinent to their being. A black backdrop allows to gather focus and narrative. An entire session including the interview and the photography can take up to 3 hours. The wrap-up is an almost slow motion animation of gentle shaking of limbs having sat through the challenging session, mutual appreciation and an embrace. 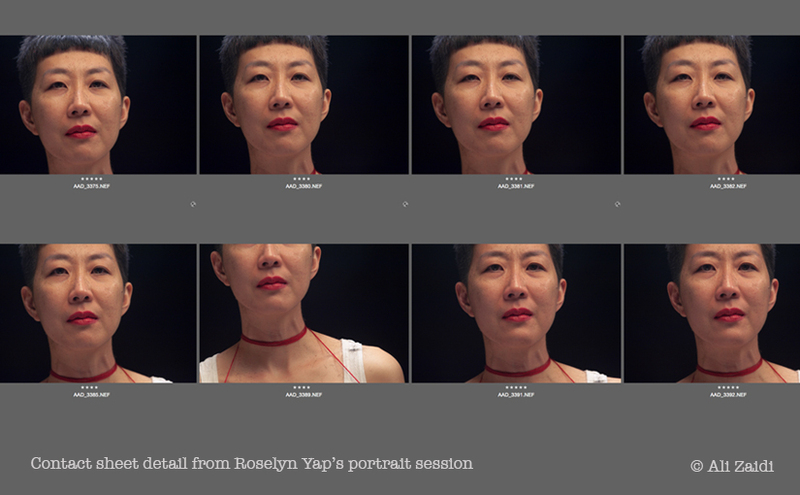 Construction: Hyper-real portrait is a self-named portraiture style that’s evolved over a period of nearly two years while working on this project. During the session I use a DSLR camera in a fixed position on a tripod, with fixed focal length and only pan/tilt is used in photographing the person. Final image is built from blending between thirty/fifty different segments of individual high resolution frames. There is no specialized software to blend the lens barrel distortions seamlessly. The finished portrait as you see it doesn’t exist. Using photoshop, working with a palimpsest of images, the size of a typical large document format can be between six to twelve gigabytes. It carries hundreds of times more visual information than a standard image. It is created by forcing multiple degrees of depth into a single image, taking an average of two days to complete. This degree of magnified focus, of hyper-reality, only exists in a post-production state. Who are these people? I am often asked this question. Participants for this body of work came from different walks of life. Some I have known for a long time, a few came through word of mouth and social media. Open calls seeking personal take on masculinity were placed on forums like Purple Port and Model Mayhem. Many are couch surfers who passed through Casa Ali and expressed a desire to be part of this. Some came via a presentation of work-in-progress talk I gave at the University of Turin. The people photographed thus far cover forty-three countries from all continents except Antarctica. The Portraits: The eyes always engage you and directly return your gaze. ‘Pose’ in its very essence requires a performance of sorts hence comes with its own mask. However, in this process, the long contemplative sitting renders the individual unmasked. On a first glance, bearing our assigned gender categories, these portraits look almost ordinary. Only on closer observation, complexities, nuances and depth is revealed. These portraits become quite extraordinary. By no means flattering, each image reveals their humanity and vulnerability – vulnerability which is their strength. The process has more to do with the person inside the body taking the images and the person within who is holding the pose. The finished (hyper-real) portrait is a transmission of healing and compassion from the giver (photographer) to the receiver (the individual) and back again; it contains elements of gratitude, understanding and a shared awareness. In my mind, weaving the sound with the image can provide a dynamic reading of these portraits. Though I have not had the means to explore this as yet. Vision thus far… I forsee 1001 UnMasked… as a work in transit, with myself as the itinerant artist visiting different cities of the world. Where ever the work will travel, people from those cities will be invited to participate in the project. Conceived as variable in scale, the material can be shown in its entirety, if the space and funds allow, or as a selection of images. It can be a formal audio-visual installation/exhibition of prints offered with magnifying lenses for closer scrutiny. OR it can be presented using VR visors with headsets in bare galleries; controllable projections allowing viewers to glide and pause over magnification and details of individual images along with localized sounds. Next steps… HELP ME lift this off! As an individual non-funded artist, more than ninety portraits have been created using my dwindling finite personal resources and the goodwill of the participants. Artistic Collaborators ~ People working on frontiers of VR/sound/new technology to explore possibilities of creating an immersive experience. Organisations/Institutions ~ At this crucial developmental stage 1001 UnMasked… would benefit from curatorial conversations, funds, space to host aspects/versions of work-in-progress and residencies. Producer/s ~ Practitioners who find synergies with this body of work and are versed in producing multi-platform projects. Terms of engagement to be agreed on the basis of commission from funds raised for the development phase. In kind support ~ Lab/s who can provide an umbrella support with facilities and expertise to determine how the images will look in print in varying sizes/finish. Individual participants ~ I am seeking more individuals. Your gender, sexuality, ability, age and size is irrelevant. I invite you to come with an open heart and lend your voice and image for this anthology that belongs to us all. Shine your truth if you feel constricted by these binaries. This takes courage… and courage attracts courage! Each participant receives a finished digital portrait as an expression of my deep gratitude. If what you have read and seen, resonates on any level, get in touch and share this post with others. Great Ali. I’ve become very interested in the stillness required to take a portrait. We’re doing a project which also requires the subjects to wait for the finished printed portrait to arrive by snail mail in analogue time. I’d be very interested to see how weight do something together here that has that slowed down/ stillness. tony i would love to discuss this with you! slowing down pairs with serotonin and speed is buddied up with adrenalin. Pingback: Tantra according to HealingHands-London, interpretations and metaphors. Next Next post: Abundance, Health and a whole lotta LOVE!